Be careful how you talk about groups of people. 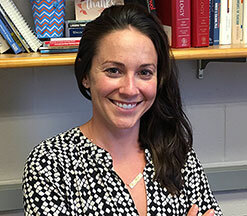 Erin Cooley, assistant professor of psychology at Colgate University, delves into how language affects what we think of people and their experiences. My research examines the cognitive, affective, and physiological mechanisms behind intergroup conflict and discrimination. I am particularly focused on understanding factors that lead people who are motivated to be egalitarian to discriminate and the consequences of subtle forms of discrimination (e.g., nonverbal behavior) on the targets of bias. Most recently, I have begun to explore how shifting American racial demographics affect the expression of prejudice toward Multiracial people and People of Color. How do you think you would feel if you heard about a “group of refugees” who were suffering? How about “refugees in a group” who were suffering? Although this turn of phrase may seem slight, recent research from our lab indicates that these language shifts can also shift how people respond to others in duress. In a first study, we asked people whether they perceive groups—such as a corporation of people—as capable of having experiences—such as pleasure and pain—to the same degree as a single employee. What do you think we found? Intuitively, one might think that groups are just compilations of many individuals, so groups should be able to experience just as much, if not more, than a lone individual. But, we found the opposite. People consistently perceived groups as having less of a capacity to have experiences than an individual. In a second study we made a minor change: while some people read about a “group of people” as in Study 1; others read about “people in a group.” Critically, phrasing mattered. While a “group of people” were perceived as capable of experiencing very little, “people in a group” were perceived as experiencing a lot. In a final study, we asked a question similar to what we originally asked you: are people also more likely to sympathize with suffering “people in a group” than a suffering “group of people?” The answer again was, yes. By shifting focus to the people within the group, rather than the group as a whole, sympathy increased significantly. Perhaps next time you are confronted with the pain of others—refugees or victims of a natural disaster—consider subtle reasons why you may, or may not, be inclined to help.